I am back today with my In Focus feature. First I am very thankful for all you support. It means a lot to me. So thank you all once again. This month’s technique is Inlaid die cut technique. In the earlier post, I had used the technique as a focal point. You can find the post HERE. Today I am using the inlaid die cut technique as the background of the card front. Here is a collage of photos showing how the card is made using the technique. 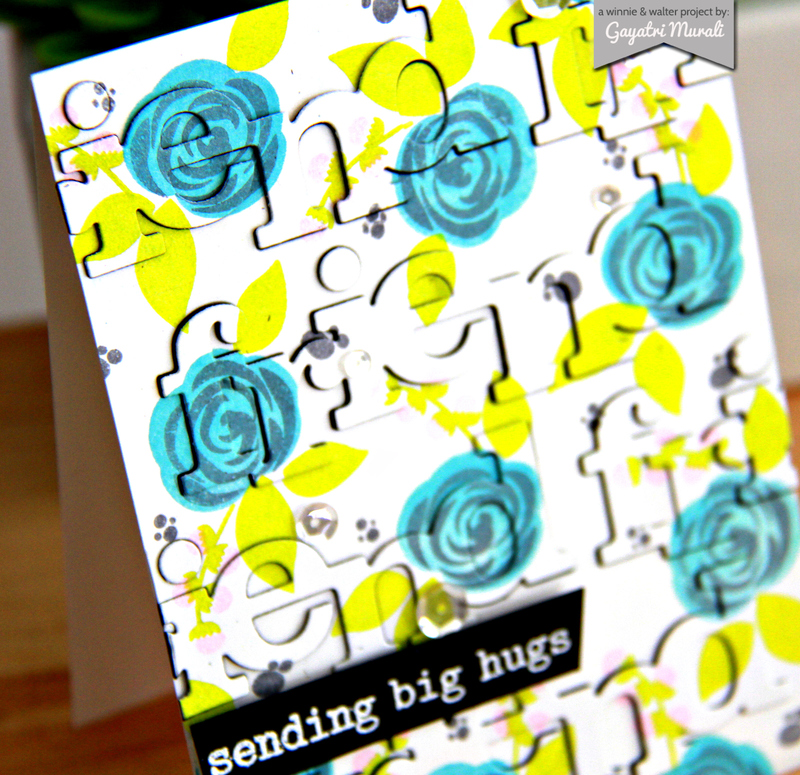 I created a stamped background using Lola’s Banquet stamp set on a white cardstock panel. I love to use pigment ink as the images stamp nice and bright compared to dye ink where the ink gets absorbed into the paper making the image lighter. Look how pretty the stamped panel is! I then used In a Word: Friend Cutaway and die cut repeatedly on the panel. I also die cut 12 more using black cardstock. I removed the die cuts from the panel and adhered the negative panel to the card front. Save all the bit and pieces from the words. Then I stacked and glued two black die cuts and the stamped die cut on top. I did this to all the die cuts. Now I glued all the stacked die cuts back in its place as well as all bits and pieces directly without the black layering. You now have subtle inlaid die cut as the background on the card front. The stacking of black die cuts gives a nice dimension to the inlaid die cuts. 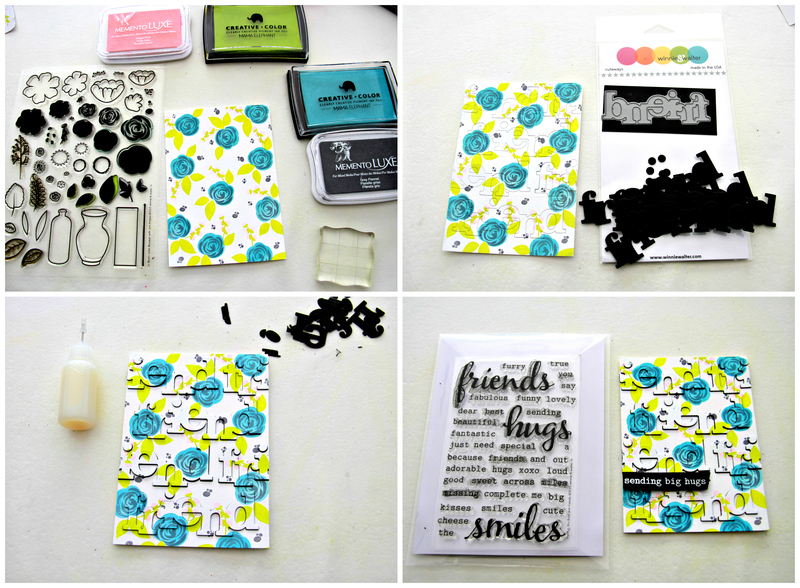 I stamped and white heat embossed the smaller focal sentiment from The Big, the Bold and Friend stamp set on a black strip of cardstock and adhered using foam adhesives. Finally added some Sparkly Clear sequins from Pretty Pink Posh. Here is a close up photo of the inlaid die cuts on the background of the card. You can see the dimension. If you like to play along, we have a linky attached with this post. Love to see what you do with this technique and keeping it as a background. I will see you next month with another technique and two styles of executing it. 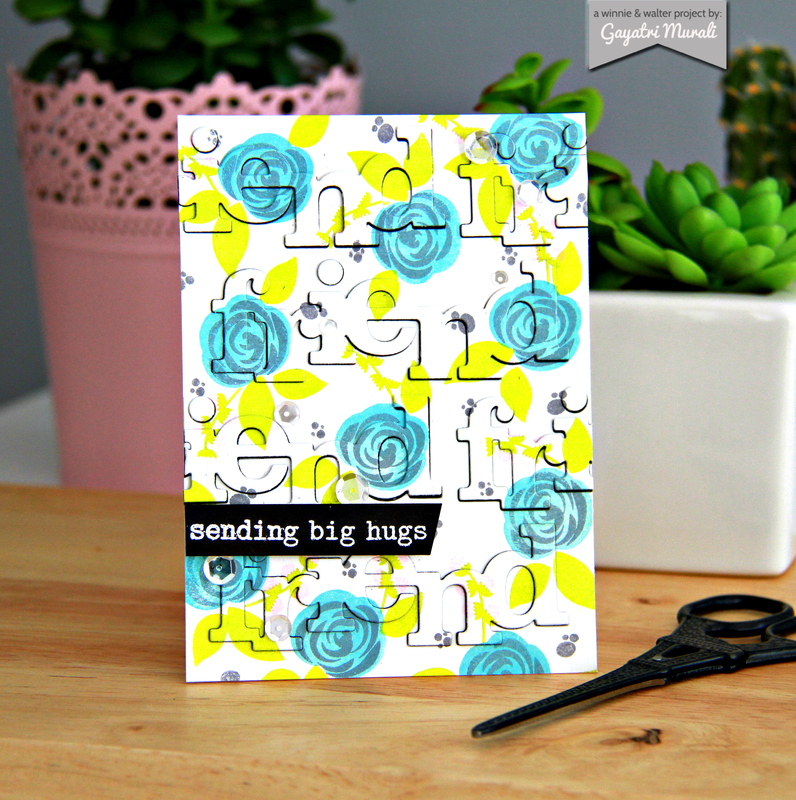 Thanks for a great photo tutorial...beautiful card Gayatri! This is awesome Gayatri and thanks for this nice tutorial. Great technique! LOVE your card! This is stunning!! I LOVE how you stamped the background and then did the die cutting on this. Thank you for a great tutorial!! Amazing technique! The result is stunning! Love the black "outline" around the words, really makes them pop against all those gorgeous, colorful flowers!! such a fabulous technique... love it!! Love this and I also am so grateful for the pics and how-tos!! So awesome!!! Your card is absolutely delightful! Love your showcase of this technique! Special Guest Star, May Flaum! In Bloom | Watercolor with Heather H.
In Bloom | Friendship with Heather H.